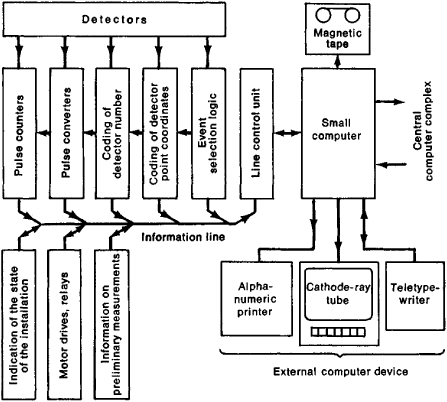 the aggregate of methods of nuclear physics in which electronic instruments are used to receive, convert, and process information from nuclear radiation detectors. In addition to applications in nuclear physics and elementary particle physics, such methods are used wherever work involves ionizing radiation—in chemistry, medicine, space research, and elsewhere. conversion circuits were developed, digital methods of data accumulation were used, multichannel and multidimensional analyses were conducted, and computers were used. In the registration of particles (or quanta), the task of nuclear electronics is to count pulses received from a detector. In the identification of the type of radiation or the investigation of the radiation’s spectrum, analysis is made of pulse wave form, pulse amplitude, or the relative delay between pulses. In the investigation of the spatial distribution of radiation, the number of detectors that have fired is recorded, or the coordinate of the detection point may be determined directly. The principal elements of the devices used in nuclear electronics include coincidence circuits, anticoincidence circuits, amplitude discriminators, linear gating circuits and adders, multichannel time and amplitude analyzers, and various devices that give a plot of information from coordinate detectors, such as spark chambers and proportional ionization chambers. A complete listing would include hundreds of items. A device for registering particles contains a detector, amplifier, signal converter, and registering device. The converter transforms the detector signal into a standard pulse or converts the amplitude or arrival time of the signal to digital code. Pulse counters, memory devices, or computers may be used to record measurement results; chart recorders and cameras are less often used. A simplified system for studying radiation spectra is shown in Figure 1. A charged particle intersects detectors (D1), (D2), and (D3) and is stopped in detector (D4). The signals from detectors (D1), (D2), and (D3) are fed through pulse shapers (S1), (S2), and (S3) to a coincidence circuit (CC), which selects events whose signals arrive at its inputs simultaneously. Simultaneity of pulse arrival is ensured by delay lines (DL). The coincidence circuit produces a signal that allows conversion of the pulse under investigation from detector (D4). The converted pulse is fed as a digital code from an analogue-to-digital converter (ADC) to a working storage unit (WSU) or a computer. The measured amplitude spectrum is displayed on the screen of a cathode-ray tube (CRT). This part of the system, enclosed within the broken line, is a multichannel amplitude analyzer. The count rate at the output of the coincidence circuit, as read out by a counter (C), shows the number of registered events. The time selection of signals is handled by coincidence circuits that operate from pulses with a specified duration and amplitude. The coincidence circuits execute the logical operation “and” (logical multiplication); that is, a signal appears at the output of the circuit only when the pulses at all inputs are of a specified level, called the unit level. If a signal with inverted polarity is applied to one of the inputs of a coincidence circuit, the circuit becomes an anticoincidence circuit. Modern coincidence and anticoincidence circuits use standard integrated circuitry (Figure 2). 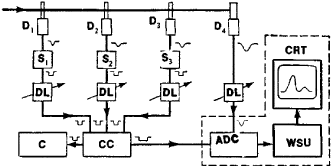 Amplitude selection is handled by discriminators based on a Schmitt trigger or tunnel diodes. The discriminators produce a standard output pulse only if the voltage (or current) at the input exceeds a specified level. Comparators are often used for amplitude discrimination. The evolution of coincidence circuits and amplitude discriminators is typical of other nuclear electronics instruments as well. In addition to units that execute a single logical operation (“and,” “or,” and so on), universal multioperation devices have been developed in which the logical operation can be assigned externally. The development of such devices has been made possible by the introduction of computers in nuclear electronics. Computer technology has also facilitated the development of automated equipment with program control of parameters: the computer controls the operating thresholds of gating circuits, time resolution, signal delay, the logic of event selection, and the mode of operation of the measuring system. Microprocessors and specialized processors for pattern recognition and for accumulation and preliminary processing of measurement results have also been introduced into practice in physical experiments (Figure 3). Experimental data are accumulated in the computer with subsequent transcription onto magnetic tape. The results of preliminary processing are displayed on the screen of a cathode-ray tube, enabling the operator to intervene during the measurement process. The computer controls various actuating devices— motors that move the detectors or target, relays, signal commutators, and the like. Elektronnye metody iadernoifiziki. Moscow, 1973. Kolpakov, I. F. Elektronnaia apparatura na liniis EVM v fizicheskom eksperimente. Moscow, 1974. Sovremennaia iadernaia elektronika, vols. 1–2. Moscow, 1974. XGLab originates from a research group with a history in the field of nuclear electronics and radiation detectors. I was enlisted and destined for Naval Nuclear Power Training Command in Orlando, FL, to train as a Nuclear Electronics Technician, with the ultimate goal to serve as a Reactor Operator aboard an aircraft carrier. com), a nuclear electronics research firm currently under contract with the Domestic Nuclear Detection Office, Department of Homeland Security. His previous developments include five generations of clinical PET systems, high-resolution PET-detector designs, and high-speed PET and nuclear electronics.